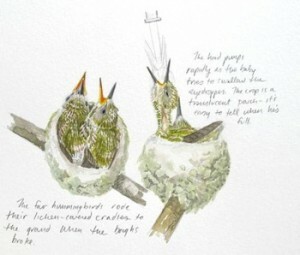 Baby hummingbirds need to be fed every twenty minutes, from predawn darkness to bedtime. Have you ever had to do anything every twenty minutes? You turn around and it’s time to do it again. 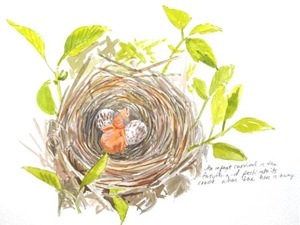 Three nestling hummingbirds grew up and, when released, buzzed around the yard behind the only mother they knew until it was time to migrate to Central America in September. The following April, all three returned to her Ohio doorstep, strong, fit, and wild, but with their “uncommon bonds” to Julie intact..
“It often begins,” she says, “with a phone call from someone who’s found a baby bird and wants to bring it over.” Julie Zickefoose is a licensed wildlife rehabilitator who has been answering such calls since 1981. She and her husband Bill Thompson III, editor of Bird Watcher’s Digest, live with their two children on 80 acres in Washington County in a house with extensive gardens, an art studio and a 42-foot bird-watching tower. 185 species of birds and 78 butterfly species have graced their sanctuary to date. 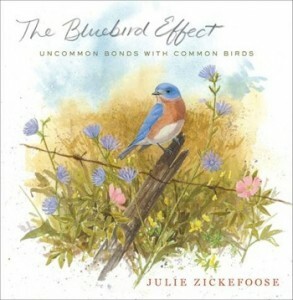 Each of the twenty-five chapters covers her experiences with a different bird species, delving into its individual natural history, quirks and, for lack of a better word, “personality.” Nearly every page showcases Zickefoose’s stunning watercolor paintings and pencil drawings. Her unique talent is synthesis: tying her observations of birds into a larger context and meaning; revealing what is astonishing about events many might not even notice. The Bluebird Effect is about what happens when, by virtue of raising it when it’s orphaned or helping it when it’s hurt, one is taken into the confidence of a wild bird. It’s about the unexpected mental and emotional capacities of birds, especially songbirds, which we tend to vastly underestimate. Everyone knows that crows and parrots are intelligent, but have you ever thought about the minds of hummingbirds? Julie Zickefoose has a unique perspective, having been mother to six. And multiple chimney swifts, cedar waxwings, mourning doves, cardinals and rose-breasted grosbeaks, to name a few. 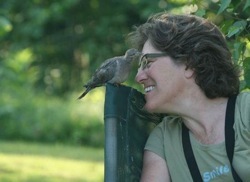 Join her for an intimate, eye-opening look at the rich mental and emotional landscape of birds. When: On the 1st and 3rd Friday of each month, from 10:00 a.m. till 12:00 p.m.
Materials Used: Binoculars (please bring your own if you have them), Spotting Scope, North American Field Guides (Sibley, Stokes, Kaufman & Peterson), Bird Songs (audio from the Cornell Lab of Ornithology), and digital bird pictures. 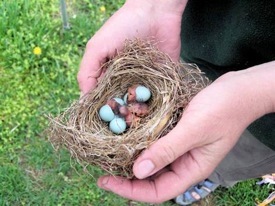 Class Content: This class is designed for anyone who enjoys watching birds, but would like to learn more about these fascinating creatures: their names, habitats, and food preferences. Lear what flowers and trees you can plant to attract specific birds. The study will mainly be on those birds most common to Georgia yards. First seeing their pictures and then trying to spot them at the Garden’s feeders, bird baths and other water features. 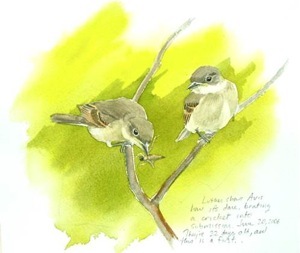 The class will conclude with a walk through the gardens looking for birds who don’t usually visit feeders because they’re fruit or insect eaters. At the conclusion of the walk, there will be a Q&A session for more inquisitive minds! Today I was supposed to write about the term bird book. But instead I sit in the intensive care unit at Shore Memorial Hospital one block from the bay in South Jersey. I did notice some rather large sea gulls early this morning by the marina. My mother is not doing so well, she’s had a heart attack, and when they went to move her to do the stent, they discovered pneumonia had set in along with a blood infection. So now it’s complicated as she’s on a ventilator to breathe easier. This person doesn’t look like my mother, who walked into the hospital just last week with all her faculties about her, of sound mind, now in an induced coma. Nature at Bird Watchers’ Fingertips! North American Guide to Birds app now available on iPhone and iPod Touch. Woodstock, Vt. (Nov. 20, 2009) – The best-selling series of National Audubon Society bird field guide books have gone mobile, putting the most authoritative and comprehensive birding information at the fingertips of iPhone and iPod Touch users. The Audubon Guide bird app provides a wealth of interactive information in a mobile package, giving bird lovers a fun and exciting experience that makes bird watching richer, more informed and instantly sharable. The bird app along with others in the Audubon Guides series is now available in the reference section of the apps store in iTunes. From Chickadees to Condors, the Audubon Guide bird app covers more than 740 species of birds with information on appearance, habitat, behavior, diet, nesting, mating, migration, endangered status and more. Features include thousands of professional color photos, more than 2,200 bird sounds, and range maps for each species. Every species in the app is described with rich and detailed information updated from the book versions: all accessed wirelessly and in real time through elegant, interactive and intuitive search features. Search parameters include common and scientific names, family, shape, range, habitat, color, and size. The apps’ geo-location search features also allow users to find which bird species are located in any zip code, state or region. A universal dashboard enables navigation back and forth between species information, search functions, sightings, and more. When loaded onto a user’s iPhone, the apps work independently of cell phone connectivity. Other innovative functions include the ability to create personalized life lists, post GPS-enabled bird sighting lists, and upload user-created photo albums. 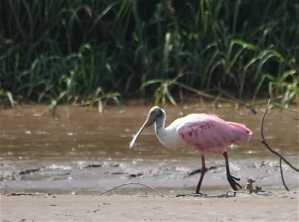 The Audubon Guide bird app is supported by AudubonGuides.com, a free companion Web site that syncs with the app, providing a lifetime of automatic updates. The Web site features all of the comprehensive subject matter found on the app, as well as scientific news, user forums, articles and blog posts contributed by nationally recognized scientists and naturalists. The Audubon Guide bird app is now available in Apple’s iTunes store at the introductory price of $19.99. Three additional apps in the Audubon Guides series – Wildflowers, Trees and Mammals – are being offered at the introductory price of $9.99 each. Birds, Wildflowers, Trees and Mammals will be followed in the next few months by mobile guides to Insects & Spiders, Butterflies, Fish, Reptiles & Amphibians, Seashells, Seashore Creatures, Mushrooms, Whales & Dolphins, and many other subjects. In this way, the Audubon Guide app series looks to deliver all of nature to consumers’ fingertips. 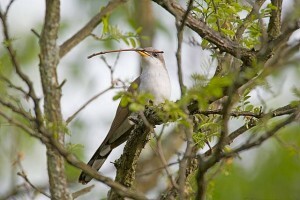 Recently I was milling through some birding forums, and was pleasantly surprised to find some great information there! 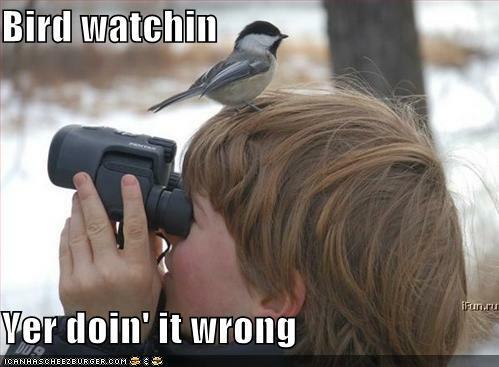 I mean real, useful, and practical tips for backyard birders. A person wrote of a great solution to the too-well known problem with tube feeders. The seed condenses and clogs at the bottom…happens all the time. This person took their bird feeder apart and placed a few ping pong balls in the bottom. Sounds kinda crazy but solves the problem of clogged tube feeders! The seed disperses around the balls instead of clumping up at the bottom of the feeder…genius! Whether bird watching in the wild or in your backyard, it’s human nature and simple curiosity to know the species you’re actually viewing. 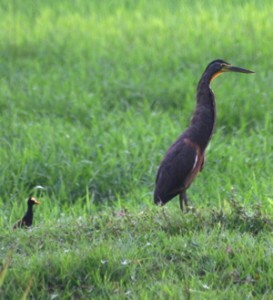 So many wild birds look alike, with the tiniest markings which differentiate the species. 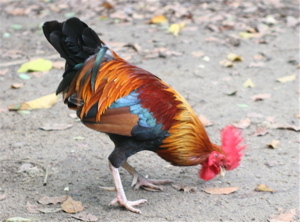 Wing bars, eye lines, beak length and color, and tail length are just a few common identifiers. It’s easy to mistake a black capped chickadee for a nuthatch, and the same for so many of the warblers. Bird Field Guides can easily answer any question as to which species you might be seeing. Indexed and well organized, they’re full of great photos and pertinent information on just about every wild bird species out there. So whether on a field trip, or watching from the breakfast room window, it’s really handy to keep a field guide close by for that special or new bird that you may glimpse and marvel at its beauty. These books make excellent and lasting gifts for any birding enthusiast too! No Bird Book From Costa Rica? Today after spotting a breath-taking, vibrant little blue bird in the yard, I thought: “cool, that’s an Indigo Bunting”. Then the second-guessing started, as this little bird did not have black wings. What was it? To answer my question, I fished out an old field guide that had been given to me as a gift many years ago. There was my answer…a Blue Grosbeak juvenile! I don’t think I’d ever seen one before in the yard. Even for avid birders, bird books always come in handy. They’re an excellent reference when trying to identify unusual species that may visit bird feeders. They make excellent and lasting gifts that will be used over the years. Stokes and Petersons are just two of the better known authors of bird books. Filled with terrific photos, and useful information, you’re bound to find your questions answered here! Whether you’re new to backyard birding, or an accomplished veteran, bird field guides always come in handy. 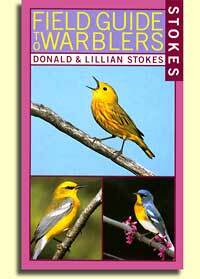 Stokes is just one of the well known authors for these birding books, giving amazing photos, information and insights. There are a myriad of field guides available, one to meet every possible birding interest. Not limited to individual species, like hummingbirds, warblers, bluebirds and purple martins, there are guides on bats, butterflies, dragonflies, and even bird gardening. Field guides are baically separated into geographic regions, making the information more pertinent to you. They are also available on audio cassettes and DVD’s. These guides make great gifts for any birding enthusisast too, novice to advanced!